Emilio Zuniga showcases the drive of Jose Luis Sanchez. Photographer Emilio Zuniga met Jose Luis Sanchez the day these photos were taken. “He just showed up and started working. I was at the gym at the right time that day,” Zuniga recalled. Sanchez is a retired U.S. Marine who was wounded by an IED in late 2011 in Afghanistan. 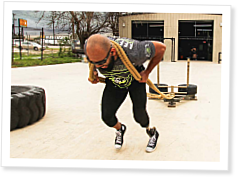 “Since then I have become an Adaptive Athlete hoping to inspire and motivate others,” Sanchez wrote on his Facebook page. We are accepting submissions throughout 2016. To submit your photo essay, read the instructions here. On Episode 298 of CrossFit Radio, host Justin Judkins interviewed HQ Seminar Staff member Josh Everett and Josh Bunch of Practice CrossFit. This episode was webcast on Oct. 2, 2013.